Despite using several different draft strategies last fantasy football season, I found that my playoff teams shared many similarities. The fantasy football community can sometimes be like a math teacher in a middle school. When you question the teacher on how you will ever use anything that looks like 2(x+5) at any point in your life outside of school, you will end up with a death stare. The teacher is probably going to come up with some convoluted example of how problems like this do apply to the real world, but if you press the issue too far, you are just going to end up in detention. The fantasy football community has people who want to tell you that drafting quarterbacks early is a bad idea, or position scarcity can start in the third round for wide receivers. Don’t be the student that just sits there without raising an objection or question. Many fantasy analysts have found winning formulas through years of experience, but some become too rigid and don’t evolve their processes. Sometimes a viewpoint can become outdated, and just like an algebra problem, it can become irrelevant in the real world. I am not knocking math teachers, as you can start a base for your problem solving and critical thinking skills through middle school math, but teachers can become too defensive when a student tries to poke holes in their craft and beliefs. The same thing can be said for fantasy football advisers. I focused my research using eight different strategies in drafting teams in standard scoring leagues last season, and four of those teams made the playoffs. One of those teams had players who all had the same exact bye week(that team somehow won five games), so considering that team as an outlier, 57% of my teams made the playoffs last season. As you can see from this team, I didn’t rely on wide receivers at all. I did, however, have a power backed rushing attack that was completely stacked. I streamed wide receivers other than T.Y. Hilton from week to week, and Andrew Luck, Jimmy Graham and the Kansas City Chiefs did the rest of the work throughout the season. This next team came in second place. 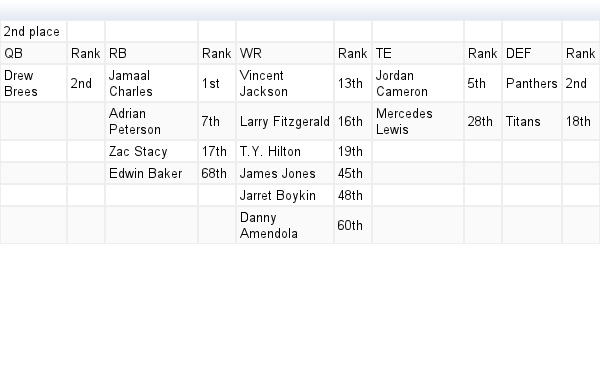 It is important to note here that I had Josh Gordon on my team through most of the season, but I traded him for Jamaal Charles. Despite the changes in the amount of receivers and running backs I owned in the top 20, I still had a top-five quarterback, a top-five tight end and a top-five defense. 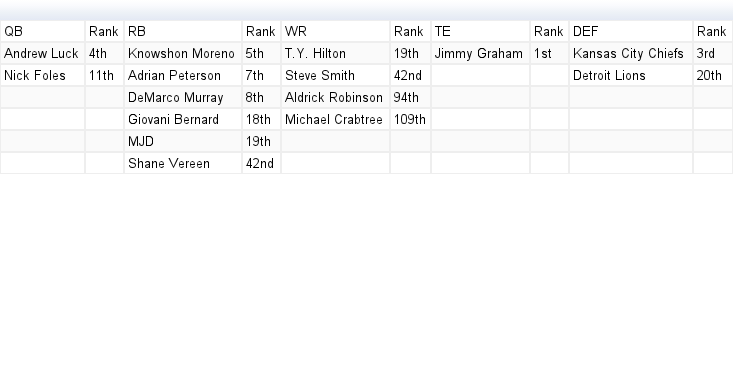 This was the first instance that I owned a wide receiver in the top 10, but once again, the amount of top-five quarterbacks, tight ends and defenses has remained the same. Finally, this team placed fourth. 3. Breaking it down by week, Drew Brees only provided an additional 4.3 more points than Andrew Luck each game. For my drafts in 2014, I want to focus on landing a quarterback who is going to be in the top five.That may sound a dumb statement, but drafting a top-five quarterback and building a well-rounded team can be easier said than done. The difference between Luck and Brees was 4.3 points per game, but the difference between the number 10 quarterback, Tony Romo, and Brees was 6 points per game. Four points isn’t going to necessarily kill you, but six points is an entire touchdown. With how important running backs were to my team, it would appear that I should focus on drafting Matthew Stafford or Luck rather than spending a first or second-round pick on Peyton Manning, Aaron Rodgers or Brees. Finding quarterbacks I could switch from week to week in the later rounds is another approach I could use to deepen other key positions. Other than that, all of my teams were well-rounded. I picked up the Kansas City Chiefs, and Jordan Cameron was a player that I identified as a tight end who could have a breakout-season. You need to hit big in your draft, but finding talent on the waiver wire gives you the edge you need to make it to the playoffs. Whatever your draft day strategy may be, be flexible. 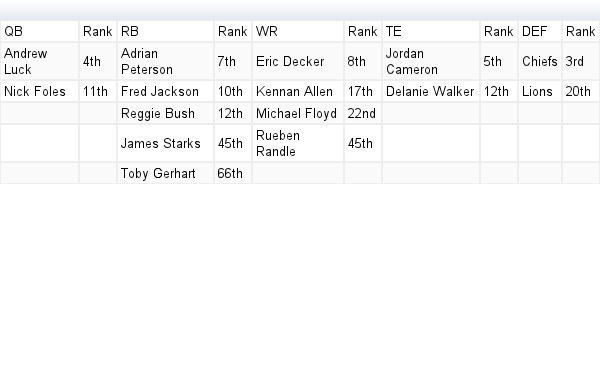 Draft a team that you like, and use data that you feel comfortable with. Let your own experiences help you make those tough decisions, and don’t feel obligated to make decisions solely based on other people’s ideas. Even mine. I hope you can take something away from my playoff teams from last season, and you find some nugget that will help you in your draft. Great post Jack. This goes along with some of the info I’ve been finding from mocks (pros and amateur). I think as the “science” of fantasy football becomes more refined, We’re going to see certain drafting strategies and positions become the norm. 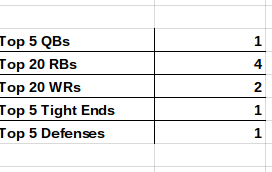 One I am working with now is drafting one tier one player for each position, and trying to nail as high of seconds as I can (WR2, RB2 and Flex). This strategy is working out. I can bypass the first three QBs and grab Stafford in the 4th or 5th, while also skipping the early tight ends and taking Jordan Cameron as late as the 6th. As long as those players are in the same top tier, you are right, there is barely a disparity of weekly average. Once you leave those tiers, you literally see gaps starting to form. Thank you Mr.Blews! Interesting stuff on the tier front, I like that idea. 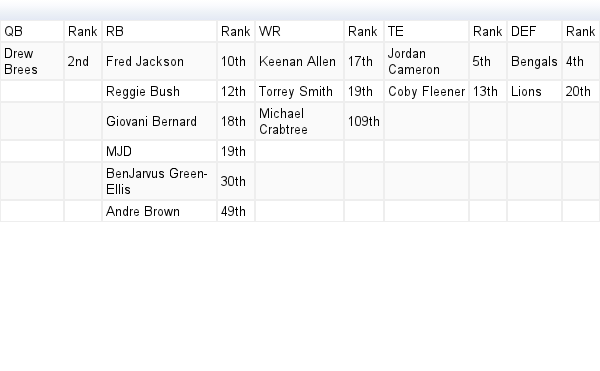 I think Matthew Berry said something like 30% of production from championship teams in all ESPN leagues came from the first round and second-round picks, so nailing down a RB1 and WR1 in round one and round two should set you up for success. 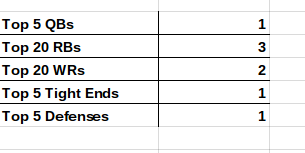 I plan on really focusing my strategies on the quarterback position this year, and seeing the results for drafting one in round one or two, the middle rounds and past round 10.